Native American Indians were a deeply spiritual people and they communicated their history, thoughts, ideas and dreams from generation to generation through Symbols and Signs such as the Warrior symbol. The origin of the Warrior symbol derives from the ancient Mississippian culture of the Mound Builders of North America and were major elements in the Southeastern Ceremonial Complex of American prehistory (S.E.C.C.). The Warrior symbol featured strongly in the Mississippian culture. They were a warlike people and this is indicated by the image. In his hand he holds a war club which was a bludgeoning weapon and in his topknot is another motif which reflects more weaponry. This symbol makes it clear that this person is not a deity as he is wearing the 'Forked Eye' surround motif indicating his residence on Earth between the Upperworld and the Underworld. The Warrior created a powerful, intimidating figure immediately associated with warfare. 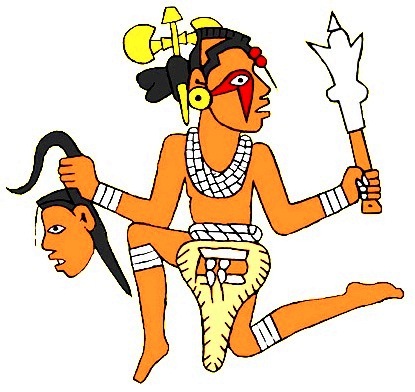 The Warrior symbol picture clearly shows that he carries a severed head. The severed head proves his prowess as a warrior. The warriors cut off the heads of their enemies as a trophy of their success. Many severed heads of enemies were displayed on 40 foot wooden pools during their Chunkey games. The most ancient Native American Indian symbols, like the Warrior symbol, came from the Mississippian culture which was established in 1000AD and continued to 1550AD onward. The Mississippian Native Americans were the last of the mound-building cultures of North America in the Midwestern, Eastern, and Southeastern United States. The Mississippian culture was based on warfare, which was represented by an array of emblems, motifs and symbols. The Mississippian culture warrior icons like the Warrior symbol provides interesting history and ideas for tattoos that include cosmic imagery depicting animals, humans and mythical beasts. The Mississippian Native Americans practiced body painting, tattooing and piercing.